Austrian auteur Michael Haneke isn’t known for his light touch, but rather for hard-hitting, award-winning gems like Hidden, Amour and The White Ribbon. So this French film may be as close as he’ll get to making a comedy. Indeed, it’s a witty exploration of family and societal dysfunction that sometimes borders on farcical. But it’s also a story about people grappling with suicidal and murderous urges. And the wry performances of its superb cast make it jarringly unforgettable. 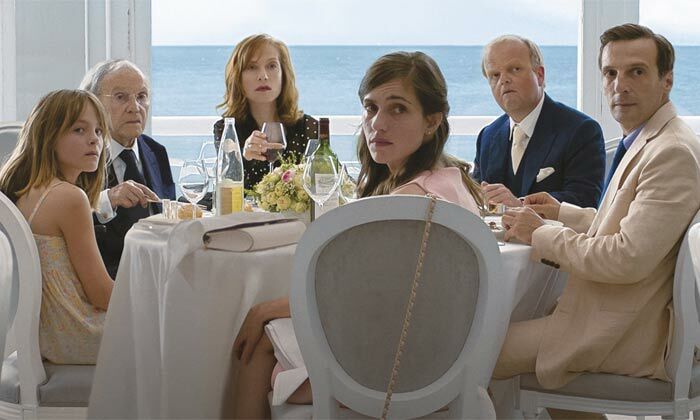 It’s set in Calais, where Anne (Isabelle Huppert) runs the family construction business and lives with her forgetful father Georges (Jean-Louis Trintingnant), her doctor brother Thomas (Mathieu Kassovitz and his shy wife Anais (Laura Verlinden). But Anne’s slacker son Pierre (Franz Rogowski) is struggling in his role as company manager, especially in the wake of an accident on one of their building sites. And Thomas now needs to care for his 13-year-old daughter Eve (Fantine Harduin) from a previous marriage. Meanwhile, dark thoughts are swirling, as Eve is posting death-obsessed videos on social media, and George is planning a startling suicide attempt. These are all complex, layered people who are so consumed by their own issues that they often fail to notice what’s happening with the people around them. And this echoes the film’s larger themes about the wealthy residents in this area who are trying to ignore the surging population of desperate immigrants amongst them. Haneke orchestrates all of this in his usual dryly involving way, but this time adds a playfulness amid the disturbing interaction. Huppert is particularly good at injecting a sardonic wit beneath Anne’s glacial expressions. This is a woman who won’t let anyone see how annoyed she is, weathering the bigger storm to proceed with both a company merger and her own engagement to her lawyer (Toby Jones). As the various plot strands swirl around Anne, the characters all come to vivid life. Each performance is spot-on, continually revealing things that neither the audience nor the other characters suspect. And through it all, Haneke never overstates the central themes. In fact, they’re so deftly woven in that it’s often unclear if he’s trying to say anything at all aside from noting the way we often feel overwhelmed by everything life throws at us. So watching all of this spiral out of control is both entertaining and challenging, a pitch black comedy peppered with pungent commentary about the injustice of modern life. This makes it somewhat frustrating, but also surprisingly cathartic.